This 100 hp V-4 target drone engine was built in Fond-Du-Lac, Wisconsin, by Kiekhaefer Aeromarine Motors, Inc. The particular engine on display was manufactured in 1953 and has a Serial Number of K-641885. 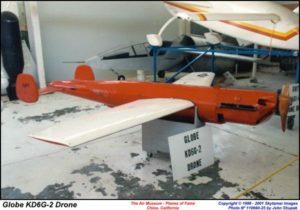 During World War II the Kiekhaefer Corporation manufactured small engines for drone applications that were used in target aircraft. Since there were no computer simulators during that time, actual small aircraft were used as target practice to teach anti-aircraft gunners to shoot down aircraft. These expendable and relatively low-cost small two-stroke engines were perfect in this role. 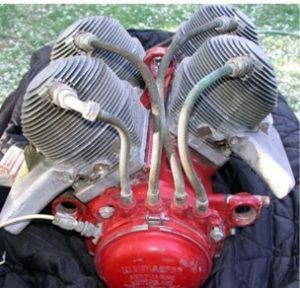 Two-stroke engines, despite offering superior power-to-weight ratios compared to 4-stroke engines, were not favored for larger manned aircraft due to excessive gasoline and lube oil consumption, not to mention their high-level annoying exhaust noise levels. The drones were ground-launched radio-controlled, all metal construction using a parachute for recovery. The Model V-105-2 engine was used to power the Globe KD6G-2 “Firefly” target drone and was used throughout the 1950s for surface-to-air and air-to-air gunnery training. Manufactured by: Kiekhafer Aeromarine Motors Inc.